The popular video blogger, the actor and the singer Troye Sivan became famous for his frank statements and bright singles. After his coming out Sivan's biography interested the considerable audience of the users. Each activity which is undertaken by the guy becomes successful: whether it is a new song, a video or a role in the movie. Troye Sivan Mellet was born on the 5th of June, 1995 in the city of Johannesburg. It is worth mentioning that Sivan is the second name of the young man, but not his middle name. When he turned two years old, the family of Troye was forced to move to Australia because of growing crime in South Africa. The boy grew up in a large family of many children, Troye has an elder brother Steele, a younger brother Tyde and a sister Sage. Troye's father Sean Mellet is a real estate agent, and his mother Laurel is a housewife. Concerning religion, Sivan is a follower of Judaism. As for his father, he was born in the Jewish family, and his mother underwent the ceremony of conversion to Judaism. Troye studied at Carmel School - it is a private Modern Orthodox educational institution. Later the young man studied at home. A mild form of a Marfan’s syndrome was revealed at Silvan. This disease is characterized by thinness and high growth. People with such syndrome have more flexible joints. It’s probably that the guy won’t have complications, possible at such syndrome, because he was diagnosed with the mild form of the disease. When the boy was 11 years old, he preferred to get involved in music and to practice it actively. As the singer Troye for the first time presented himself in 2006, he sang a duet with the winner of the "Australian Idol" - Guy Sebastian. 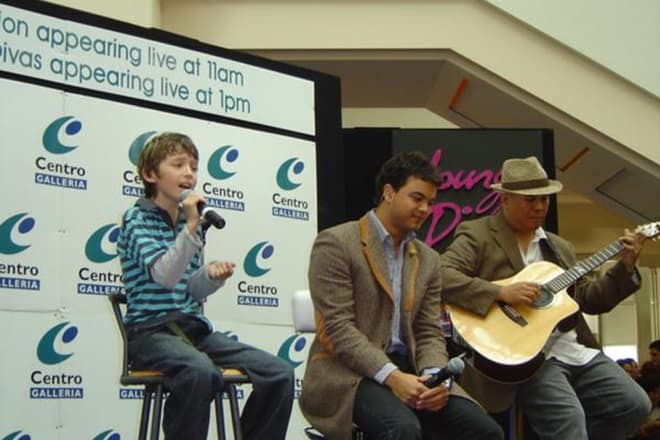 Sivan sang at the telethon of "Channel Seven Perth" 3 years in a row: 2006, 2007 and 2008. In February 2008 Troye released his first independent album which contained 5 tracks. Two years later, in February 2010, Sivan opened the charity concert "We Are The World 25 for Haiti" with his song. This event was aimed at the collection of money for victims of the earthquake on Haiti. Sivan has come in grips with the recording of the cover songs of popular performers and he also composes songs. The track "The Fault In Our Stars" became the most well-known at that time. Music and the text for this track were written personally by Troye. The eponymous book by John Green became the inspiration for the young man. In July 2014 Troye released the composition under the title "Happy Little Pill" in support of his official mini-album "TRXYE" consisting of 5 songs. The release had taken place on the 15th of August the same year on the major Universal label. The song video was shot and presented a few days before the release. The year 2014 was significant for Troye by the fact that he had entered the world rate of influential teenagers according to "Time" version. 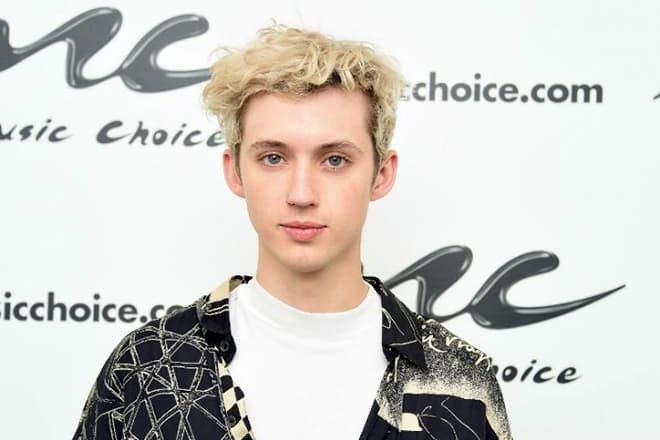 In March 2015 Sivan received YouTube Music Award thanks to the fact that he had entered the list of 50 popular singers of this resource. The second EP "Wild" consisting of 6 songs was released on the 4th of September, 2015. On the same day, three-song videos in support of the disc came out. In the song video, the story divided into three parts is told. In autumn of the same year, there was announced the date of the release of the full-value album under the title "Blue Neighborhood": the release was set for the 4th of December. There are 2 versions of the album: the standard one consists of 10 singles, and an extended version contains 16 tracks. "YOUTH" and "FOOLS" are two of the most well-known tracks. On the 11th of January the single "My My My!" was premiered. On the 18th of January the track "The Good Side" was released. On the 3rd of May, the single "Bloom" was released. Sivan announced that his future album would be called "BLOOM". Troye Sivan is openly gay, he had publicly made his coming out, having uploaded the video to YouTube on the 7th of August, 2013. 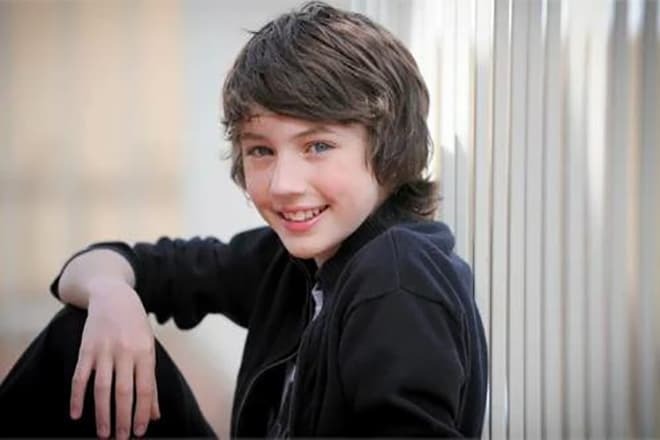 His family members learned about the non-conventional orientation of Troye 3 years before the release of this video. In the video, the cheerful blogger frankly told the public about the fact how amusing and funny it was to be a gay. After this video, his admirers became interested in the blogger's beloved. There was an assumption that Connor Franta was his boyfriend, as the young man had also confessed in his non-conventional orientation. 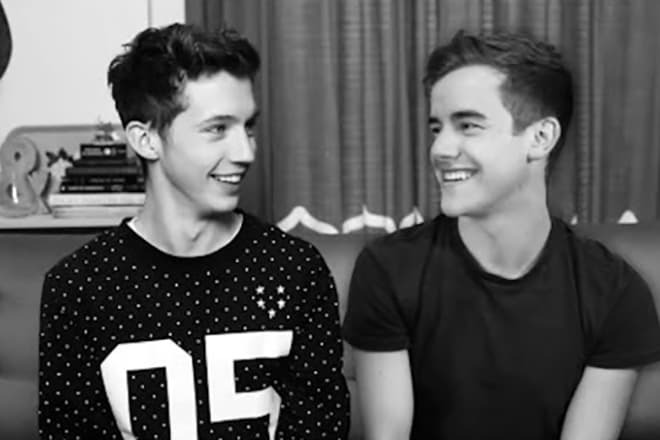 Connor and Troye had many joint photos. Nevertheless, young people continued to claim that they were just Internet friends. The video accompanying the coming out was shot by Tyler Oakley who is known as openly gay too. Sivan denied that Oakley was his boyfriend, and called the event a usual coincidence. Guys had many joint photos and videos. As for Oakley’s personality, he is a video blogger, a TV host and human rights activist. His activity is directly connected with gender problems in the society and the rights of sexual minorities. Despite the excuses of the guys, some fans continued to consider that they had been in romantic relations. 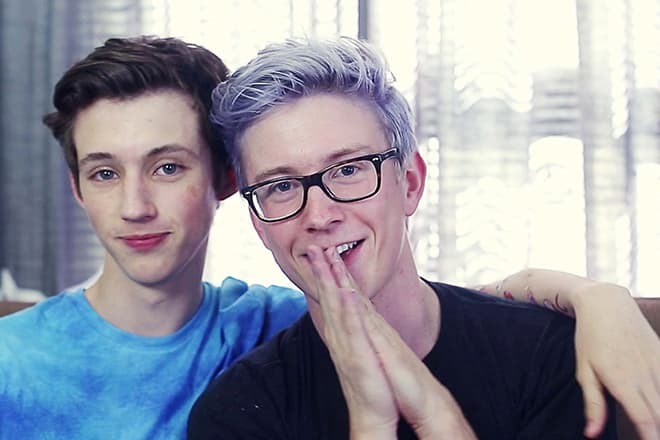 Their fans even had made up them a general name - "Troyler". 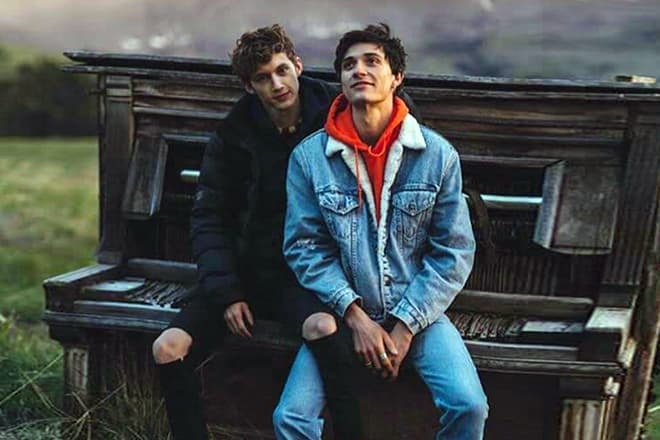 Today Troye is engaged in the relationship with the model Jacob Bixenman who lives in Los Angeles. Sivan is often noticed in Jacob's company, they have many joint photos where the young men hold hands. It’s obvious that the young people prefer to keep their romantic relations in secret. "I hope that the beloved of my brother will win today". The account on YouTube was created on the 1st of October, 2007, but Sivan actively leads it from autumn, 2012. According to the information on May 2018, Troye has more than 6 million subscribers and there is a quarter of one billion viewings. His video blog enters TOP-20 most viewed channels of Australia. As for the account on the Instagram social network, there Troye has millions of subscribers. Sivan regularly updates this social network, sharing with his fans the events which take place in his life. In 2017 Troye Sivan was approved for the role of Gary in the biographic drama "Boy Erased" with Lucas Hedges in the leading role. The director of the picture is a popular Australian actor Joel Edgerton. The premiere was set for autumn, 2018. Events in the movie are developed around the young son of the Baptist pastor who discovers in himself an inclination to homosexuality. Russell Crowe and Nicole Kidman also performed in this picture. The trailer of the movie "Boy Erased"
Sivan became the new face of the male line of the popular Valentino fashion brand. Shootings took place in autumn of 2017, but Troye announced the cooperation with the popular brand on his social network only at the beginning of January 2018. Now the talented blogger is a popular and wealthy person, his wealth is estimated at $2 million. 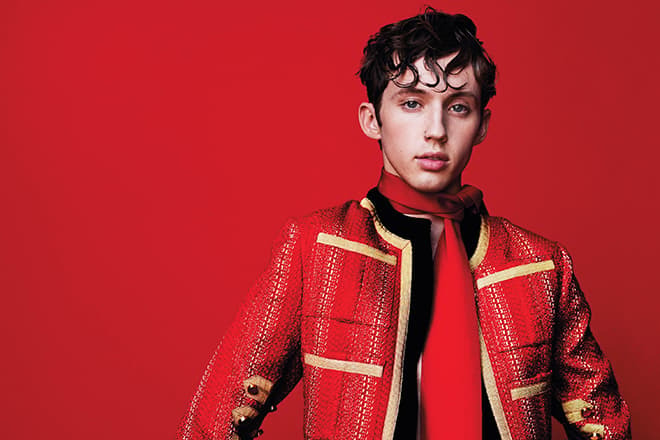 Troye Sivan doesn't tell about his plans for family life and career. 2010 - "SPUD: The Movie Soundtrack"
2011 - "Love Is A Losing Game"
2011 - "The One That Got Away"
2011 - "Pumped Up Kicks"
2009 – "X-Men Origins: Wolverine"
2010 – "Bertrand the Terrible"
2011 – "Spud 2: The Madness Continues"
2014 – "Spud 2: The Madness Continues"